For most users, windows media player is probably the most frequently used tool for playing all types of video or audio formats, however, this is not the only app for you to experience video viewing. A better alternative recommended here is using VLC media player 2.0.1, which is most widely spread among numerous software programs. In the article, we will review this multimedia player comprehensively; please try to get some general information so that you can clear up some puzzles of using VLC media player. VLC 2.0.1 can support working on multiple operating system such as Microsoft windows 7, vista, Linux, BSD, GNU and Mac OS X etc. 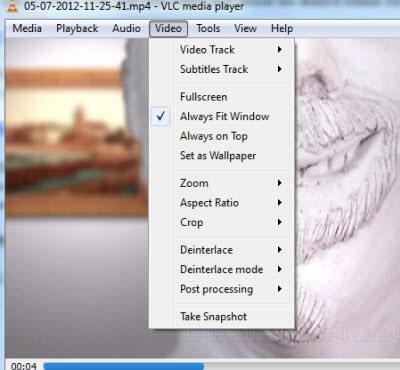 VLC’s codecs is capable of performing encoding and decoding on a digital data stream or video playback. VLC media player has updated to V2.0.1 whose size is only 21.2 MB. In the process of installation, you just need to select the language and click “next” to wait for the installation to be completed. If you have installed it on your computer, it is advisable to update to the latest version. Just download the app from CNET or from its official website. 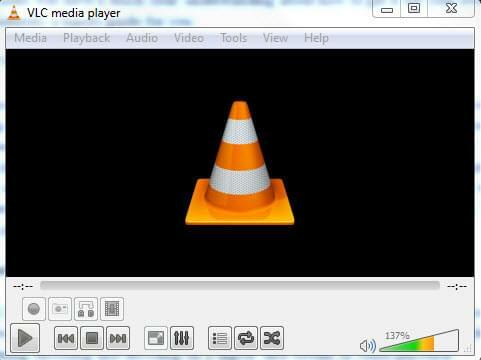 VLC media player is simple to use that also comes with a pile of powerful features that users demand, let’s look at each of these options and how you can apply it properly. The first option that matters most is its multimedia player for playing everything on your system. That’s to say, VLC handles most of the video, audio and input format files like MPEG-4, FLV, H.264, WMV, DVB, SVD, WebM, BluRay etc. Besides, this app adopts GPU decoding technology so that it can be used for HD media playback. Click “Media” to open file from your video playlist and right hit on “Full Screen” tab to get full screen viewing. Likewise, it supports DVD movies playback. The embedded video streaming server can let you listen to internet radio or stream video content directly. From media menu, just open network stream to meet your requirement. All you need to do is enter a network URL into the address box and click “play”. Or else, hit “View” icon to select the playlist, the drop-download menu will appear like this such as media library, podcasts, Freebox TV etc. Since you can stream video or TV shows in VLC media player, you might be wondering whether it is feasible to record live internet TV for future review. Many knotty problems will be smoothly solved by the aid of VLC 2.0.1. After installation, go to “view” icon to select “Advanced Controls”, and then a few options including “Record” will appear on the interface. In fact, it acts as a screen video grabber. Before recording, you have to play live TV shows in VLC. Now record any activities on your desktop. 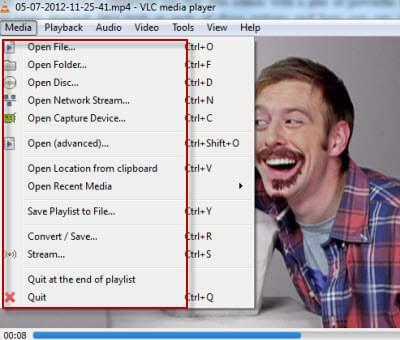 The video file will be saved in your selected folder as an mp4. Wanna convert videos directly on this media player? Yes, this program also offers this function; no additional software need be done. From media menu, you will see “convert/save” icon, add your videos and choose the desired format for converting. With audio function, you can get all these done including change audio track, sync video or audio, make some visualizations, automatically process volume control etc. Other enhanced video effects can be achieved by editing. For instance, users are able to crop some video part, capture video as screenshots and subtitle the movie project etc. In a word, VLC meida player 2.0.1 is a great app out here for users on various operating systems. Beyond doubt, it is far more than a multimedia player, users will be impressed by its extra functions. Not only can you play everything in it, but also regard it as video capture device to capture justin.tv, liveleak or other internet TV shows. Why not keep this free open-source stored on your hard drive discs. It won’t let you down. How do you transfer vlc movies to windows media player, as I cannot get the movies to play on my laptop, the movies are in VLC. I am not a computer expert so need detailed description of the method or software that will enable me to do this transfer, because at present I can only play on my VLC software, most frustrating, cannot give to others to view on their PC's.